Once upon a time, a group of elephants lived in a forest. The elephants were lead by a king elephant. One summer, the water in the area where they lived dried up. The elephants were starving without water. The king elephant knew about another lake in that forest. He decided to take other elephants to that part of the forest. The elephants then set off for that lake. After walking for few nights and days, the elephants reached the lake. They were delighted to see the water in the lake. But as the elephants marched towards the lake, they tramped upon hundreds of hares that were living near that lake. Hundreds of hares died and other hares were worried about their life. Those poor hares didn't know about what to do. One wiser hare among them came forward and said that he would talk to the king of those elephants and solve this problem. Then that hare went to meet the king of elephants. The king elephant welcomed the hare and asked why did he come to see him. 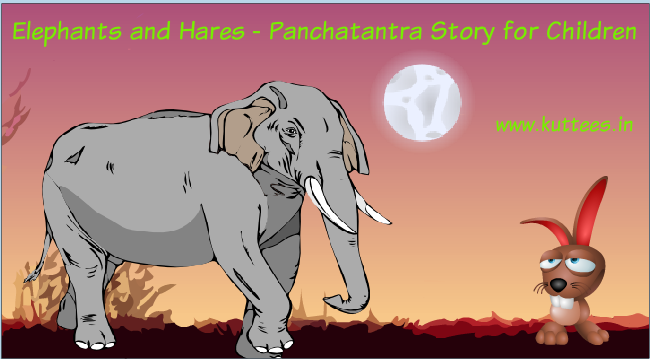 The smart hare said, "Dear king of Elephants., I have come to see you with a message from our Moon God. The Moon God is very angry on you for drinking water from his lake." The King elephant laughed. " Lord Moon? Where is he now? ", asked the king. The hare replied, "He is very much in the same lake. He has come to console us." "Then, let me see him immediately", said the King Elephant and went to the lake. The hare showed the reflection of the Moon in the lake water. Taking the reflection for the real Moon, the elephant king believed what the hare told him. He immediately saluted the reflection, apologised for their mistakes and moved away from the lake with all his elephants. The hares breathed a sigh of relief and lived happily ever after.